Recently, one of my blogging buddies, Veronnica, posted a recpie for easy ice cream cookie sandwiches. They were adorable, and jogged my memory – when I made Grammy’s chocolate cookies for Christmas, I promised myself I’d make them into ice cream sandwiches once warmer weather rolled around. 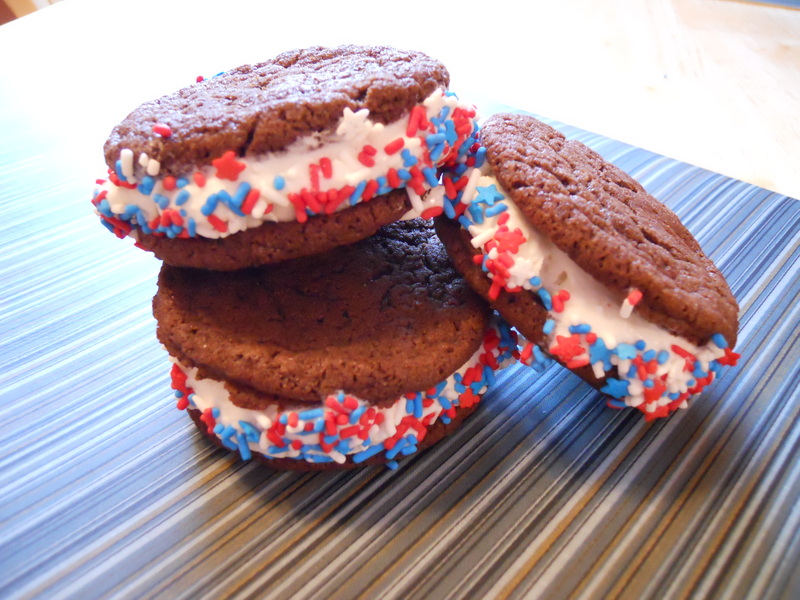 At Wegmans this week, I noticed red, white and blue sprinkles in the bulk bins and decided it was fate – our 4th of July dessert was going to be ice cream sandwiches. The concept of these are easy – some ice cream sandwiched between cookies and rolled in sprinkles. In a time crunch you could use store-bought cookies and ice cream, but if you have the time to make both from scratch you get something really magical. I believe the chocolate cookies are perfect for this – they’re flat, chewy and regardless of how lumpy your dough balls are, they come out round. Whatever dessert you’re having today, I hope you all have a very happy and relaxing 4th of July! Match up cookies in pairs of about the same size and shape. 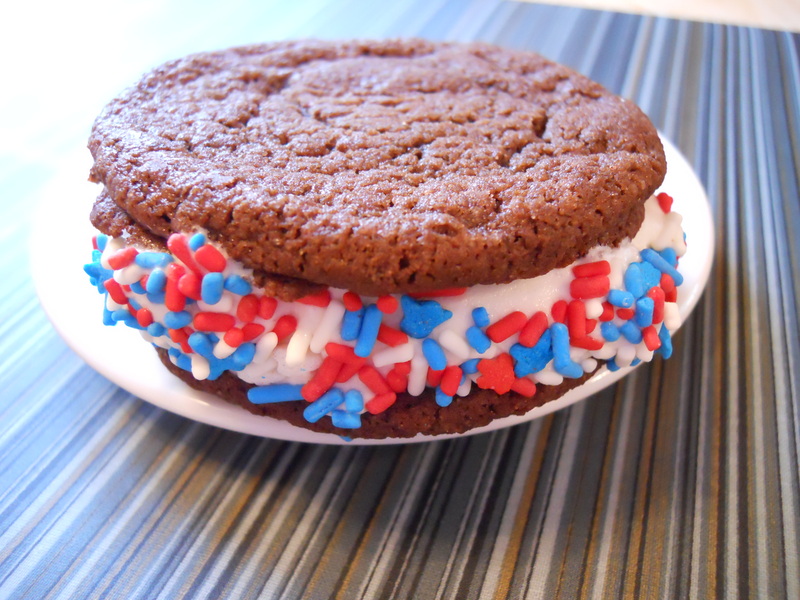 Add a dollop of ice cream to one cookie and gently press on partner cookie to make the sandwich. Roll gently in sprinkles and place on a parchment-lined cookie sheet. Quickly transfer to freezer and freeze until set. Place milk and sugar in a medium bowl. Mix with a hand mixer on low speed for 1 to 2 minutes or until sugar is dissolved. Stir in heavy cream and vanilla. Freeze according to ice cream maker directions. If not making the ice cream immediately, cover and refrigerate until ready to use.